Expect Miracles Foundation's mission to provide funding for life-saving cancer research, is coupled with a dedicated commitment to support families impacted by this disease. At YPEM Smiles4Kyle, over 40 young professionals gathered to rally support for the virtual campaign that has the potential to provide Kyle a new mobility van. Kyle, born with a neuron migration disorder which has made him non-ambulatory and non-verbal, is 17 years old and attends his local high school. He is a smart, optimistic, and brave individual who, despite all obstacles, is constantly smiling to express his love of life, family and friends. Now, as his father battles cancer, Kyle is a constant beacon of hope and reminder of the importance of perseverance. See the story of this remarkable young hero, here. Mid way through the evening YPEM President, Chas Goodman, thanked everyone for attending and for their continued support of both Expect Miracles Foundation and the Smile4Kyle campaign. He encouraged attendees to use the computer on site to either register, or cast their vote for the day, and maintain support for the Erickson family. In exchange for donating, attendees were entered to win a number of prizes including Vineyard Vine flip flops, Ame & Lulu beach bag, Harpoon gift pack, Sperry summer package, and the grand prize, a pair of Red Sox tickets. 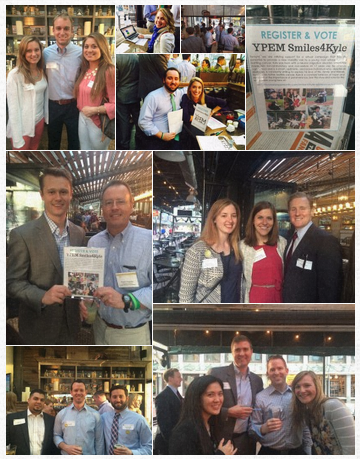 This successful event was a great start to the warm weather season and we look forward to seeing everyone at our next Young Professionals Expect Miracles event this summer!